I'm always intrigued whenever anyone complains about arched bridges not having "accurate" clearance heights. As has been said, how wide is the rectangular topped boat going through the semi-circle ? It has to be a compromise for "average" width boats. Strowy's bridge info is spot on in my opinion. Iv'e used this for my last boat and again for this one, a Sheerline 950 AC, and found it to be pretty accurate. details shown here. The gauge was showing 7' 6" I believe at the time of the photo. Bill what is the airdraft of your Sheerline pls ? Mark, it's 6' 10" exactly with everything down. The arch hinge point being the highest point on the boat. Went under Wayford Bridge at the weekend with the gauge showing 7' and had about 2" to spare, so that gauge is pretty near correct too. Not at the moment Bill, but its an ambition that I hope to realise in around four years or so. As Eric says its a lovely looking Boat you have there. Interesting what you said about Wayford. When we took Thunder through last Oct the gauge stated 7ft and we were 6'10'' before allowing for the nav lights which are 2'' and they only just made it under, so can vouch for the accuracy on that one. We used to have a Sheerline 950AC and it's so easy to remove the canopy etc quickly if you need to. We now have a Sheerline 1050 aft cabin and that takes a bit longer.. The first season we had her( 2011) we were returning from Oulton Broad one Sunday with guests on board who needed to get back for work the next day. When we got to Somerleyton we were told by the bridge operator that he wouldn't open it because it was too hot! We'd always intended to take down the canopy etc. just to see how easy it was( or not) as a practice run for when it became necessary but of course had never got round to actually doing it. The gauge said we'd got 2" more than we needed with everything down including screens. So we formed a chain and took it all down piece by piece, fortunately our guests were boat owners and knew what to do to help, we got it down in 5 minutes and went under sitting on the floor of the cockpit. Apparently, according to our guests, who were in a better position to see than us to see, The radar arch hinge went under with about half a inch to spare. When we got out the other side of the bridge there was a hire boat full of what appeared to be Eastenders as one of them called out "cor blimey mate, you still got your 'air?". Still at least we made it in one piece. We love our Sheerline even though the height makes her a little less flexible on where we can go than the 950 was. This was me taking Broad Ambition through Wroxham, with 6' 6" bang on the gauge. I rather like the video as now I can always refer to this and think 'I did it then I can do it again'. we are taking a 44 ft x 11 foot boat out in October according to calculations made with the info i have been able to get from this forum i shouuld be able to get her through Wroxham , obviously because she is a hire vessel the pilot will have that responsibility and indeed the final say, the issue i have is not necessarily going Wroxham to Coltishall more the other way , as i'm led to believe if it is miserable weather it can alter the depth of water under the bridge, so the question i am asking myself is " do i go through and not get back or do i not go through and then kick myself for not going when i could have got back ". October is a long way off but the end of May approaches and we'll be there for a week . The pilot will guide you I am sure, if it comes to that scenario Bob. Its amazing what a dozen extra bodies on board can do to boat heights! Hireboat is AF Pearl 38 Grande Girl 1 from Summercraft, booked Saturday 28th May to Saturday 4th June. I believe airdraft of this boat is 6'10"
I want to get upstream on the evening of Thursday 2nd June, and return early next morning Friday 3rd, but low water on these days isn't quite right for my travel plans. On the Thursday heading towards Coltishall low water is predicted to be 17:52 and I could do with getting under a little before that, say 16:30 because 1) I don't want to be too late to get a mooring and 2) I think the pilot will have gone home by 17:52. If the common is full I need to get back to Wroxham for a mooring, so early is good. In everyone's opinion, and given that it takes (on a falling tide) maybe 7 or so hours to fall from high water to low water, is this do-able? It would be 6 or so hours after high water and an hour and a half or so before low water on an ebbing tide. The bigger question is next morning, low water is predicted for 06:25 but that's far too early to get the 90 minutes from Coltishall, so I could do with getting through at about 9:00 (earlier if there is a pilot) which is 2.5 hours after low water, and about 3 hours before High water on a rising tide. Half way between low and high water, squeeky bum time maybe? The bridge is listed as 7'3" at low water, with a potential rise of 6" to high water level taking it to maybe 6'9", but with the bridge arch and the width of the boat to consider I'm looking for the voices of experience here. Some of you will have the same or similar boats and will maybe have considered a similar scenario, any opinions? Do you have to be very close to LW or is there a rule of thumb tolerance? 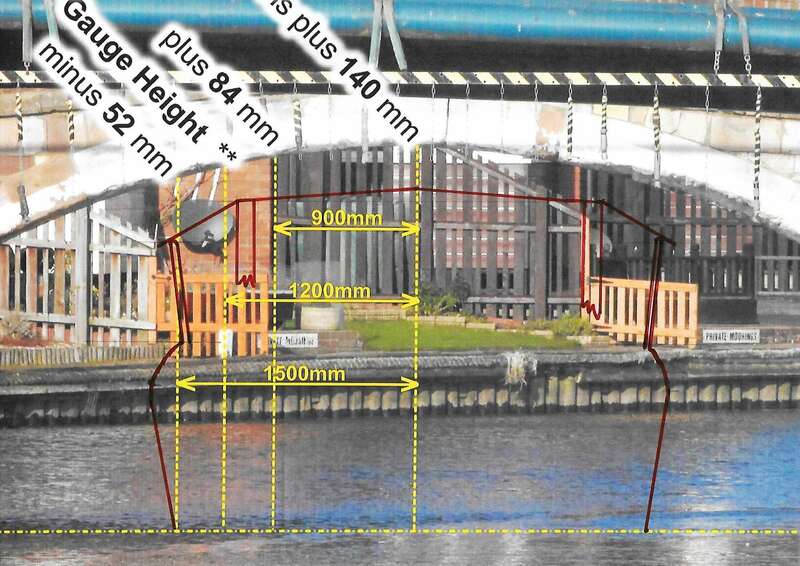 I suppose what I'm considering is that if the height can range from 6'9" to 7'3" is there 7'0" clearance half way between LW and HW and would the boat with it's width get through a bridge that's arched? Next I'll try nuclear physics, it's probably simpler. Also, Summercraft offer a free passage through the bridge, I'll ask them myself obviously but it's evening now so does anyone know if they take you through themselves or do they just pay NBD? If it's them doing it there's a better chance of getting the times I want as the queue will probably be shorter. Thanks in advance for giving up your knowledge freely, it's invaluable and I'm hoping to be as useful myself one day. Unless the weather takes a turn for the worse, and the tide is higher than normal, to use a pun, you should sail through Wroxham Bridge with the pilot. If there is any doubt, they would not let you go in the first place. Great yard you are with, and a well turned out boat for sure. Have a great holiday, with pics and tale afterwards, please! We used to have a share in Evening Shadow which is a pearl 38. My minimum was 7foot and it passed with a good 2 inches all round and that was with me at the helm. Yes we did have a Pearl 38 named Avalon and the airdraft was stated as 6'10" but was slightly less. to be done at speed and has to be dead centre too! I would say that you have a 'fair' chance of doing it even being an hour early if the conditions are right. can be seen, it can vary considerably depending on conditions at the time. 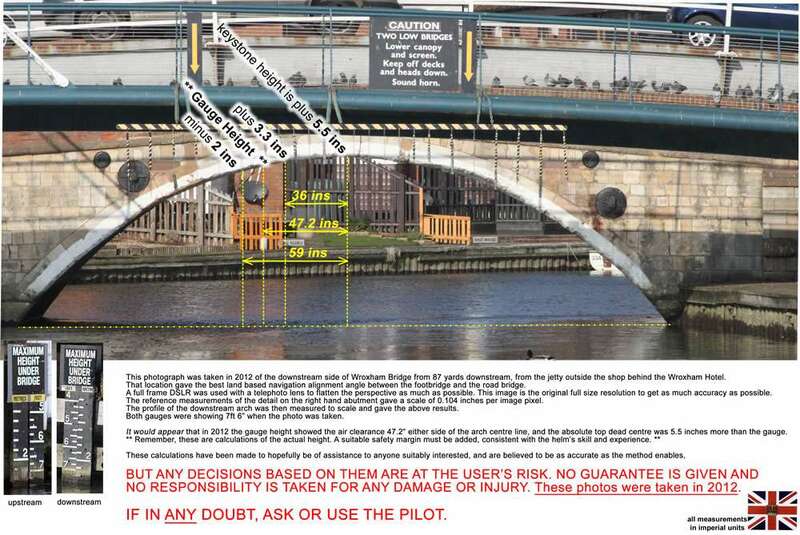 Thanks for the answers, Bill yours in particular and I can see how pressure (high meaning better bridge clearance?) rain (less meaning better bridge clearance?) and wind (sorry madam, it must have been something I ate). It's just to get an idea whether to spend the penultimate day of our hols heading for Wroxham with the reward of previously unvisited Coltishall, or spend that day maybe on the Ant or somewhere. All part of learning and taking advantage of others experience. The River Bure up to Coltishall, has always been a favourite of ours, a fair chance you may spot the odd Kingfisher if your lucky.